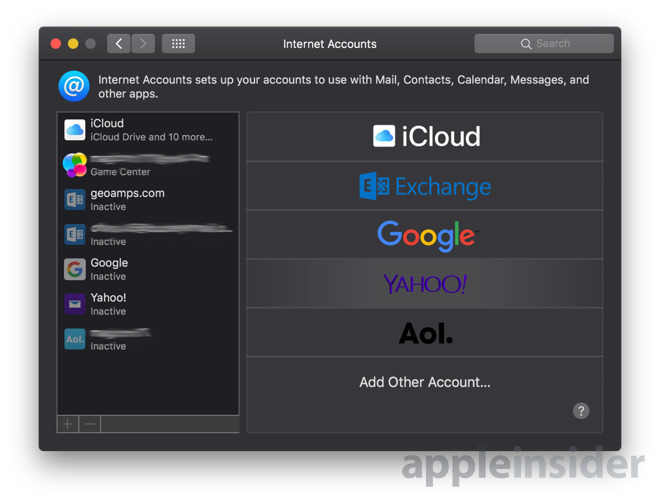 Continuing a policy that began with iOS 11, Apple has apparently stripped out integration of third-party accounts in macOS Mojave beyond email and calendar services. Facebook, Flickr, Twitter, and Vimeo are no longer options in the first developer beta of Mojave, AppleInsider can verify. Saving login info made it simpler for users and apps to access and share to those services. Support initially came to the Mac with 2012's OS X Mountain Lion, the first edition of OS X with Share Sheets. Once people were signed into a service, they could simply click a button to publish to it, instead of having to use the Web or sign into an app's specific integration. The switch in Mojave means that sharing options will disappear in many parts of macOS, assuming Apple decides to make the change permanent. The move is presumably a part of Apple's attempts to bolster the overall security of macOS. The company is tightening permissions, making it harder for advertisers to "fingerprint" users, and creating the concept of "notarized" apps for titles sold outside the Mac App Store. Mojave will launch sometime this fall, likely alongside or just ahead of new Macs.